"How can I see clearly when I play sports if I don't wear contact lenses?" Have you ever wondered if there is any other solution to playing sports if you and or your child cannot wear contact lenses? This is the most common question posed to certain athletes and parents when they are faced with the challenge of being unable to handle (apply and remove) contact lenses. There are also other circumstances where both the parents and the doctor decide the child is just too young to be wearing contacts. Whenever this is the case, the next best choice would be to consider alternative sports eyewear in the form of impact resistant lenses and sports goggles. 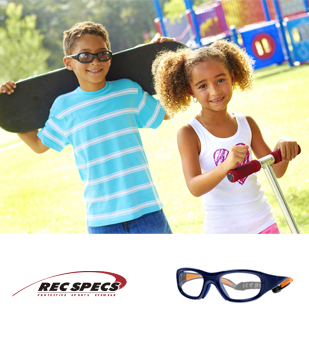 As seen in many of today's top athletes, sports goggles serve as a means of visual correction for high myopia (nearsightedness) and astigmatism. In fact athletes of today are also finding use in sports goggles as a way to protect their eyes either from recent injuries or as preventive measures. In certain indoor stadiums or outdoor field environments, goggles may serve as a valuable ocular tool in cutting glare caused by overhead lighting or bright sunlight. At Stein Optometric Center, we have partnered up with Liberty Sport, one of the leading providers of sports eyewear and the first protective sport eyewear to receive the AOA Seal of acceptance, to ensure that our patients receive the best possible protection and fashionable eyewear for their game. Please ask your doctor about how the staff at Stein Optometric Center can assist you in providing the best experience in your competitive or recreational sport. We also have industrial and personal work safety eyewear.